Another Meatless Monday and not sure what to make for dinner? Don’t worry I got you covered this week with these Can’t Beet this Cauliflower Brusslin’ Buddha Bowls! So much whole food flavor comes together in these delicious and nutritious bowls I cannot wait to make them again when we get back home. As I mentioned last week we’re still in California. Expo ended yesterday but we’re down here a couple more days soaking up the much needed sun and family time. 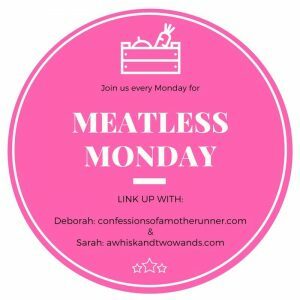 You know the saying, never miss a Monday and that’s true in the sense I couldn’t miss my weekly Meatless Monday link up with co-host Deborah. If you are linking up I will be checking out the recipes when I get back home or while sitting at the airport. 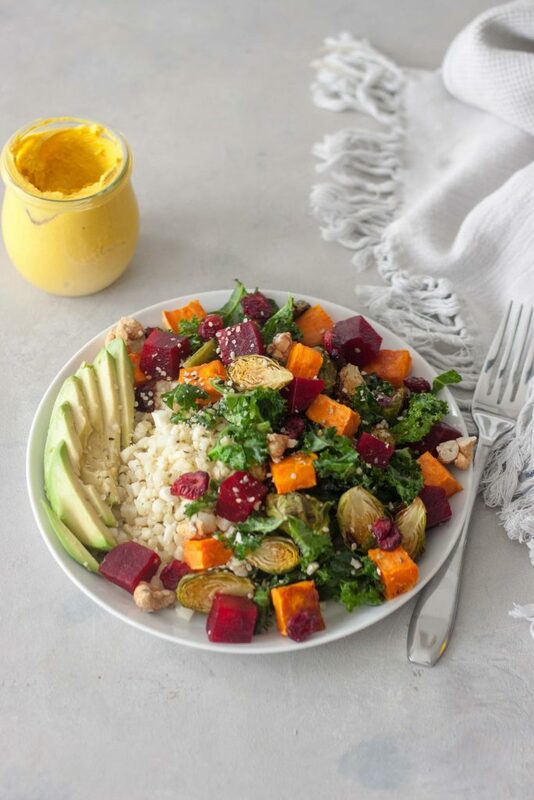 So why do I call them Can’t Beet this Cauliflower Brusslin’ Buddha Bowls? Easy there is so much flavor, texture, color, and nutrition the combo can’t be beat! A little pun on works as these bowls are packed with beets, cauliflower rice, and Brussel Sprouts but that’s not all! I’ve also added sweet potato, avocado, kale, hemp seeds, dried cranberry and a creamy dreamy Turmeric Tahini Dressing! It might seem like a lot but it’s easy to make, there are things that can be made ahead of easy meal prep, and easy substitutions to meet your families needs and what you have on hand. You can swap the cauliflower rice for brown rice, the hemp seeds for pumpkin seeds or another seed/nut. I also assemble the bowls so that if one of the girls doesn’t want an ingredient (beets, sweet potato, dressing, ect) I can leave it off making it an easy family friendly meal. I do this a lot and it’s one of the reasons I love Buddha bowls or dishes like this. One meal but so easy to customize for everyone. Often it’s even pulling leftovers or things out of the fridge to add or substitute. Aside from all the vitamins, minerals, and just overall whole food nutrition packed in these bowls I’ve also got some of my favorite anti-inflammatory foods! If you’re a regular readier you’ll know I’ve been all about anti-inflammatory foods, especially in the last year and a half to two years. Cauliflower is like winning the antioxidant and phytonutrient lottery, packed with vitamin C, beta-carotene, kaempferol, quercetin, rutin, cinnamic acid, and much more. Beets are a source of phytonutrients called betalains. Betanin and vulgaxanthin are the two best-studied betalains from beets, and both have been shown to provide antioxidant, anti-inflammatory, and detoxification support. Brussel Sprouts have vitamin K, vitamin C, and antioxidants. Aside from that they also contain folate, manganese, vitamin B6, fiber, choline, copper, vitamin B1, potassium, and so much more. Cruciferous Vegetables Kale and Brussel Sprouts.Kale is an incredibly effective anti-inflammatory food, potentially preventing and even reversing these illnesses. Brussels sprouts anti-inflammatory abilities are found in its supply of vitamins K and C, various antioxidants. Sweet Potatos are great source of complex carbs, fiber, beta-carotene, manganese and vitamin B6 and C.
Pumpkin seeds are filled with minerals including phosphorus, magnesium, manganese, iron and copper. Pumpkin seeds, along with many other seeds and nuts, help reduce inflammation. Hemp seeds provide protein, magnesium, fiber, and essential minerals. Turmeric supports a healthy immune system as it’s packed with antioxidants and includes great anti-inflammatory properties. Ginger is well known for it’s anti-inflammatory properties. To help relieve nausea, help with digestion, and for helping relieve pain and reduce inflammation. Extra Virgin Olive Oil is referred to as the secret to longevity in Mediterranean culture, this oil provides a healthy dose of fats that fights inflammation. I think I pretty much justifies the name of these bowls and why you Can’t Beet This Cauliflower Brusselin’ Buddha Bowls! Although the flavor and color alone also helps. I hope you all have a great week, as I mentioned I’m still away and with that I think I’ll be taking the rest of the week off from posting so I can enjoy the rest of the vacation, process everything from Expo, enjoy my birthday and St. Patrick’s Day, and come back next week refreshed and inspired. I always have so many ideas and things going through my head after Expo and vacation. Don’t forget to follow along over on Instagram where I’ll still plan on sharing some finds from Expo and life maybe more on Stories than my feed but either way if I end up getting online it will be there. Again if there are any recipes or things you want to see or see more of be sure to leave a comment below or message me! *NOTE: The dressing in jar is not a representation of dressing used, it is not nearly as thick as it look. 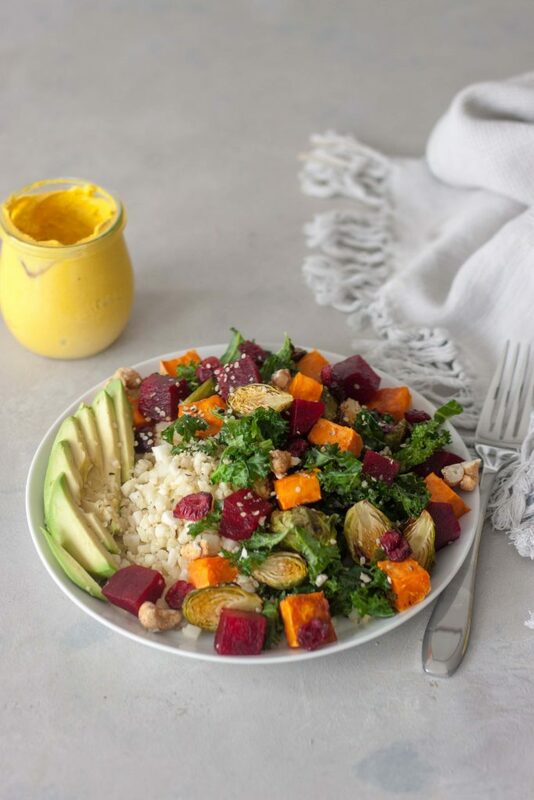 Can't Beet This Cauliflower Brusslin' Buddha Bowls are packed with whole food nutrition, texture, flavor, and color sure to have your taste buds dancing! A combo that tastes good and good for you, with many anti-oxidant benefits this bowl is plant-based, gluten free, and vegan. If you need to cook your beets you can also do this now but you will want to start them ahead as they will take about 45-60 minutes and you'll want to peel and cool them. I batch cook beets ahead and keep them in the refrigerator or use already pre-cooked beets. Peel sweet potatoes and cut into cubes, toss with a little oil or spray a baking sheet sheet with coconut/evoo oil and on top. Season lightly with sea salt. Slice Brussel sprouts in half, toss with a little oil or spray a baking sheet sheet with coconut/evoo oil and on top. Season lightly with sea salt and pepper. Cook both sweet potatoes and Brussels for 30-40 minutes, turning half way. While the veggies are roasting blend the ingredients together for the Turmeric Tahini Dressing until smooth. Place in the refrigerator until assembling bowls. When you have about 5 minute left on your veggies (if you haven't prepped them ahead) you can start the cauliflower rice. In a large skillet heat 1 tablespoon of oil over medium-high heat. You want enough to coat the bottom of your pan. Once it's hot add in your cauliflower rice (see notes if making your own) and garlic. Sauté for 3-5 minutes. Remove from heat and fluff with a fork. Add rice to your bowls or plates. Add a little oil to the same oil and sauté your kale for about 2 minutes. You don't want it to be mushy just slightly wilted and softened. Add kale to your cauliflower rice. 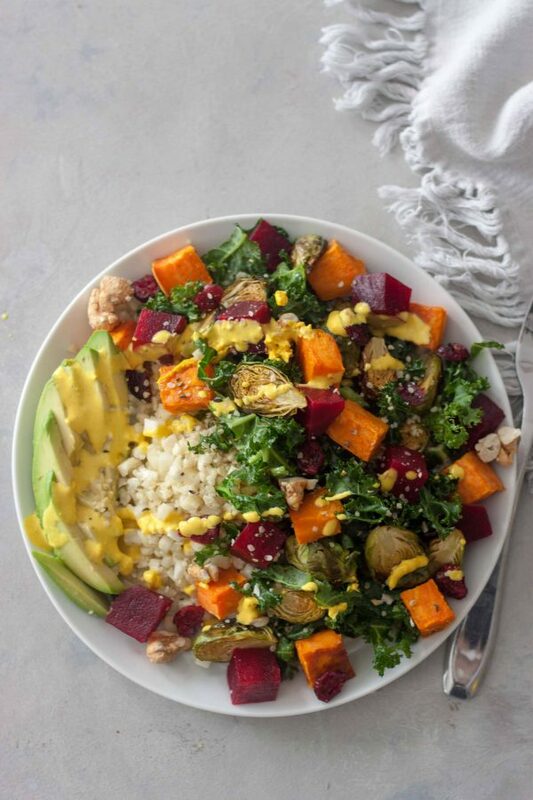 Top bowls with sweet potatoes, Brussel sprouts, and beets. Slice or cube your avocado and add to your bowls along with hemp seeds and dried cranberries. Serve or drizzle with Turmeric Tahini Dressing. Hehe I love the name of this bowl! As always, looks delicious! This is a spectacular combo indeed! Hope your enjoying California! Thank you it was a great trip and as much as much as I felt like I tried to relax it was still an exhausting trip. You can make it with regular rice but I like to up the veggies. S is a rice fan so I usually make both. Yum! all my favorites in one bowl! That dressing I am pinning for sure! It’s such a great bowl, I think you’d enjoy it! Thank you, all the colors, flavor, and nutrition! This is gorgeous!!! I love all the colors! Thank you Whitney! It makes so much flavor, texture, and nutrition it has your taste buds dancing and head spinning. Yes, so many anti-inflammatory ingredients in this bowl! I’m hungry now! 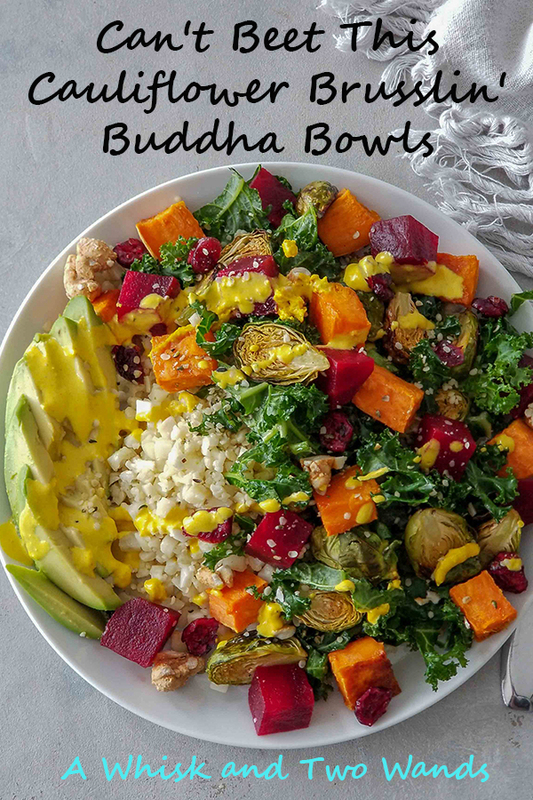 This buddha bowl looks PERFECT! Love all of the good, healthy things that you’ve included here. So yummy and perfect for lunch! What a gorgeous bowl! It’s filled with everything I love! Would love this for lunch any day of the week! that looks so great and tasty! I tried it and it is delicious, but I never managed to make it look so perfect… i should keep on working, thank you! You really know how to do color in your meals Sarah. This looks amazing – especially with that turmeric drizzle.